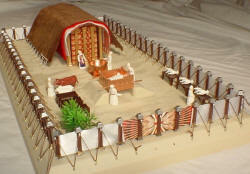 "27:1 "Build an altar of acacia wood, three cubits high; it is to be square, five cubits long and five cubits wide. 2 Make a horn at each of the four corners, so that the horns and the altar are of one piece, and overlay the altar with bronze . 3 Make all its utensils of bronze --its pots to remove the ashes, and its shovels, sprinkling bowls, meat forks and firepans. 4 Make a grating for it, a bronze network, and make a bronze ring at each of the four corners of the network. 5 Put it under the ledge of the altar so that it is halfway up the altar . 6 Make poles of acacia wood for the altar and overlay them with bronze . 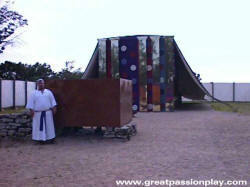 7 The poles are to be inserted into the rings so they will be on two sides of the altar when it is carried. 8 Make the altar hollow, out of boards. It is to be made just as you were shown on the mountain." 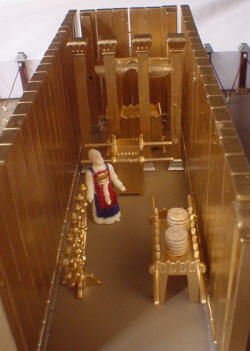 Below is an artist concept of the Bronze altar that stood at the front of the Tabernacle. This drawing is by Brent Kington a Christian who is also a noted artist and metalsmith. 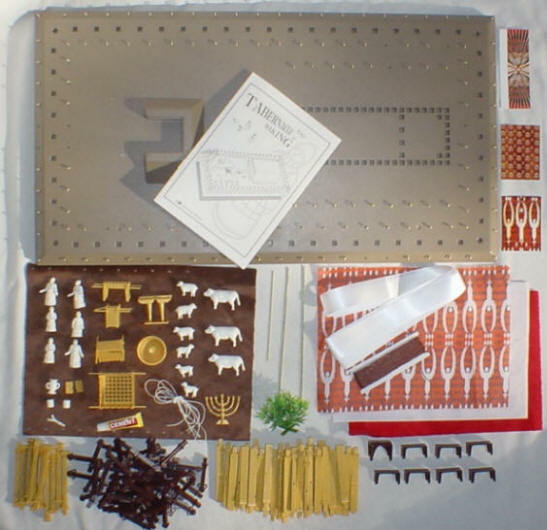 He has interpreted the Bible text in light of practical metal working of ancient times. The altar is described as being made of acacia wood overlaid with bronze. We know that it had four "horns", one on each corner on which the blood of the sacrifice was sprinkled. We cannot tell for sure if the bronze was gilded or sheet overlay. We are going to assume it was heavy bronze leaf. 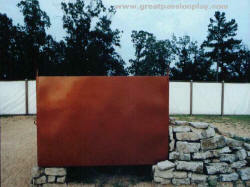 Thick bronze would not have necessarily protect the wood from the heat and would have only added weight. The acacia wood seems to have been the structure and the bronze seems to have been a decorative overlay which added some weather and damage protection to the altar. We do not know how long the poles would have been to carry the altar. Based on the idea of minimum weight we will assume poles long enough for 4 men to transport the altar with one man at each corner. This would make the poles 3 to 4 feet longer on each side for a total pole length of about 15 feet or 10 cubits. Since a cubit is approximately 18 inches the altar was some 7.5 feet wide and long and 4.5 feet tall. 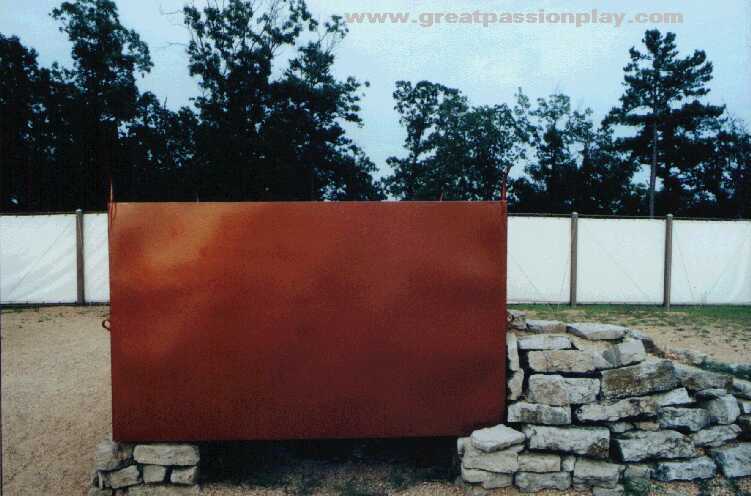 Left is a picture of the bronze altar as envisioned by the folks at "The Great Passion Play" who built a full scale model of the Tabernacle. You can use this image for comparison to our concept. As you can see when comparing Kington's drawing with the model that there is some difference in interpretation. The photo below is a different view of the altar above and shows an earthen and rock ramp up the side so that the priests can reach the altar top. 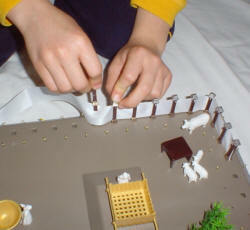 The altar as envisioned by the modelers has very small horns that are barely visible in the photo. Below is a cut away view showing how the bronze altar could have acted as a support for an earth base. One of the things that has mystified readers of the text is the question of how could metal covered wood withstand the heat of the fire. Metal transfers heat well and if the metal came in contact with the fire then the wood underneath would be destroyed. The cut-away view below as drawn by Kington shows how the metal encased wooden frame could have been used as a supporting structure for an earthen pit. The earth would have protected the wooden frame of the bronze altar from being destroyed by the heat of the fire. This type "fire pit" was not unknown in the ancient world. This design would have been very effective and portable. This design well fits our principles of meeting the Bible text, being easily portable, fitting the ancient processes and also having beauty. It also answers some criticisms of why the Bible describes a wooden structured item that could hold fire without being destroyed. Other features of Kington's design are how the bronze grating could have been designed to both support the sacrifice and also be the rings through which the poles would have been inserted to lift the altar. The artist has made the bronze grating a little shorter than the sides of the altar so that when the grating is down then it doesn't touch the altar sides and thus doesn't transmit damaging heat to the wooden structure. After the grating has cooled and the poles are inserted then when the poles are lifted the grating comes up under the altar sides and lifts the rest of the altar off of the ground. The altar is shown with supports at each corner to keep the sides up off of the ground to allow air vents under the altar to feed the fire. Though these vents are not described in the text, functionally, it is believed that they would have been necessary and thus they are included. This design meets the Bible text and is very portable, beautiful and practical.